Finnish Oven Pancakes are a perennial forgotten favorite around our house. Perennial in that we make them semi-often. Semi-often in that I forget how simple a solution they are for last minute hot breakfasts, lunches or dinners until the children remind me. I make them often enough that I remember there are 4 ingredients and I think I remember the quantities, but infrequently enough that I have to consult my human encyclopaedia de cuisine: my stepmother. The conversations run like this. Me: Hi, Val. It’s me. I am calling because I’m making Finnish Oven Pancakes again. Me: I forgot again. And I didn’t write it down again. Val: (with the patience of Job) Four eggs, 1 cup of flour, 1 cup of milk, sugar, salt. Me: Thank you and I love you. Val: You’re welcome and I love you, too. We have repeated this conversation about three times a year for about 16 years. It’s not that I make this three times a year. It’s that I make it in streaks, forget about it until the kids beg for it, smack myself in the head for having forgotten this recipe and hoist the phone to my ear once again. Thankfully, I have a very patient stepmother. Thankfully, I say, because this is a recipe that should be added to your regular rotation and you deserve to know Val’s recipe. And thankfully, too, because finally, I am writing it out. Writing it out so that I can share it all with you, yes. But even more, writing it out means that I can stop annoying my beloved Val. Well, at least about this particular recipe. I’ll still call her for my knitting patterns, the-name-of-that-one-website-we-were-talking-about, the recipe for her oatmeal bread, that book title, which Mr. Bean episode had the hymn that they played while the Titanic was sinking, and the name of Hyacinth Bucket’s son. Like I said, Val is a very patient woman. But about these Finnish Oven Pancakes. These fixtures of Finnish cuisine are prominent in many communities in the U.S. where there is a high population of Finn immigrants. The Upper Peninsula (Go, Yoop, eh?) has a huge Finnish community. They have graced us with all manner of cured fish and baked goods, but these? These are one of their best. Finnish Oven Pancakes the love child of pancakes and custard. They puff up like a Yorkshire pudding. They have structure -not wet, by any means- and texture, but they’re still soft. Ranging from not-at-all-sweet to good-and-sweet and everywhere in between, Finnish Oven Pancakes can accompany everything from a simple sprinkle of sugar and squeeze of lemon to jam to sweetened whipped cream and Nutella to sausage gravy to stewed venison to seared mushrooms. Not all together, of course, but all this is to say it’s a very flexible meal base. It takes four ingredients; all of which will probably be in your pantry and/or refrigerator barring natural disasters or winter storms*. Eggs, flour, milk, and salt. Sugar is one-hundred percent optional. *You will note that I don’t classify a winter storm as a natural disaster. That is because I’m from Michigan. We’re tough. No whining about snow here, people. Bring. it. on. Scroll to the bottom for an easy-print version of this recipe! Preheat oven to 400°F. When the oven temperature reaches about 300°F, place an 8- or 9-inch cake pan or 10-inch pie plate in the oven with the butter in it. The butter should melt, but not brown, while the oven finishes heating. Place the eggs, f lour, milk, salt, sugar and vanilla (if using) in the carafe of a blender. Fix the cover in place and blend on high, stopping to scrape down the sides if necessary, until the mixture is smooth and even. When the oven is fully heated, and the butter is fully melted, pull the oven rack out far enough to work safely and pour the batter into the hot pan. Push the rack carefully back into the oven and bake for 30-40 minutes, or until the oven pancake has puffed quite high and is a deep golden brown. You can test the doneness by quickly inserting a butter knife in the center of the oven pancake. If the knife comes out clean, the pancake is done. Remove the pan from the oven, cut immediately (it will deflate some, so don’t worry!) and serve topped as desired. Did you get a chance to read about my Wii Just Dance Kids giveaway? The sky has not fallen, I’m actually giving away a brand-spankin’ new copy of this great game. You have until this Sunday morning (the 5th of December) to enter. See here for details. Remove the pan from the oven, cut immediately (it will deflate some, so don't worry!) and serve topped as desired. I think I will have to make these this weekend. Great weekend breakfast treat! Yum! My parents used to make these and serve them with a Grand Marnier sauce. I like the lemon/powdered sugar best. I bet my munchkins will love this! And it looks so easy too. Yum! Oh my, this sounds awesome. I must try this recipe! I just came across this recipe via Tastespotting and, in addition to the pancakes, am very pleased to have found your blog – food and random thoughts are one of my very favourite combinations, and the conversations between you and Val remind me so much of similar conversations, mostly with my mum, but with assorted others as well. *Anything* described as the love child of pancakes and custard will be getting a run in my house before the week’s through! made this over the weekend… SO yummy with the lemon and powdered sugar! will be making it again for SURE! Thanks! It’s in the oven right now! I’m making the unsweetened version which we’re going to have with some bacon and cream gravy – didn’t have any sausage in the fridge today. I’m definitely going to try it next time with lemon, vanilla and sugar. Thanks for sharing this recipe! i prefer the david eyres version … lighter and easier to make! i made pannukakku after i read this post but i found it heavy. Just finished cleaning up after making this. It was wonderful… But I had a problem with how mine formed up. I used a pie plate and at the edges it was 8 inches tall. So that part was slightly dry but still great. Ever have this issue? Anyone have thoughts for dealing with it? This is just what happens at times–we just take it as part of the joy of the dish, a nice variation to the soft custardy part. Beating the mixture less can decrease the height of the edge, but I’m sure other variables are involved, so no guarantees! We eat these quite a bit for breakfast! We called them DP’s or German Pancakes. We love the lemon and powdered sugar the best. I love the idea to make them savory though and am going to have to try it. I have a recipe similar to this one that I really like but decided to give yours a try for comparison. I thought they were both great, my husband liked yours a little better so i’m going to have to replace my other one! I added a sliced apple into the batter before baking, soo good! I’m going to try this soon! We have to eat dairy free though due to my son’s allergy so I’m going to attempt to make these with either vanilla almond milk or coconut milk. I think they’ll still turn out tasty though!! LOVED your story – this is EXACTLY the problem I have with this recipe – I recall that it is so obvious I should have it memorized but make it so sporadically that I have to tear around to find it. (Now I know I can just call Val! lol) One day I will make a specific place for our favourites. I would frame them all on the wall if I had any real wall space in the kitchen. Maybe screen them onto tea towels? We especially like to make this recipe for sleepover mornings where the drama of the rise is appreciated as entertainment. We top it with whatever fresh fruit is in season and the kids are proud and LOVE IT. Oh, this makes me so hungry. I just found your website and I am in LOVE!!! I have made a recipe that is almost the same and it was given to me by a dear friend who called this German Pancakes. We use 1 cup milk, six eggs and 1 cup flour. Have never used sugar, salt or vanilla. I bake it in a 9×13 pan with a full stick of melted butter, for 20 – 25 minutes. My favorite toppings are applesauce with maple syrup poured over it or just good peach or strawberry jam!! I used to make two pansful of this for my gang of eight. (six kids) It was one of their favorite breakfasts and the best part is how simple to prepare and how quickly it bakes and is ready to feed the hungry family. Thanks for reminding me of this. I found the best way to not forget this sweet recipe is to print it out and scotch tape it to the inside of the cupboard door. I know I’m super late commenting on this but I’ve just recently found your blog. My husband and I shared this for dinner last week when there just wasn’t anything in the house to cook and we were fighting for each last spec and crumb. Thanks for sharing! This looks so good and I love that it can be sweet or savory! Bookmarked this one to try soon! I had to laugh about the Yuppers- my husband & I honeymooned in the U P and had a great time with the accent. Lovely area! My version uses white spelt flour (I have issues with wheat), 4 tablespoons of sugar, and a dollop of quality vanilla. Oh, and I always bake it in a nice big cast iron skillet with high sides rather than a cake pan. I think it comes out better. Well, I think everything comes out better when cooked in cast iron. I’m from Finland, 18 years old girl. I’m baking pancake in oven right now, I googled “pancake in oven” in english just find out if Americans make their pancakes in oven like we Finns do. In here, pancakes are baked in a deep baking sheet, not a cake pan. Usually it’s a dessert because we eat it with sugar, syrup or berry jam. I’ve never ever heard about eating pancakes with onions or beef etc.! I would strongly advise against this recipe. The consistency is very heavy where Finnish pancakes are normally supposed to be light & airy. There is not nearly enough milk compared to the amount of flour. 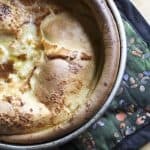 I would highly recommend the recipe for finnish-pancake-suomalainen-pannukakku from cooks.com instead. It’s interesting how there are so many schools of thought on which one is most ‘authentic’ isn’t it? This is the one I grew up loving, so it’s definitely the one I make by default. Mine is more custardy than popovery but I’ve had them both ways. To each their own! Hi! My husband just made this recipe and I shared it on my blog, along with a link to your page! It was delicious! I’m a new Finnish Pancake addict 🙂 thanks for sharing. Love these. I’m getting the recipe from my grandma now. We had these growing up. We would always cook up bacon and put it in the batter then cook it. Then serve it with strawberry jam and sour cream. SOOO GOOOOD!!! I plan on making these in the morning. That sounds insanely good! I love the idea of bacon in these! To each their own! As a Yooper, I’m standing by this as a versatile version! Yours sounds tasty, too. I’m a Yooper too! There are so many Finns up here. They know how to make pannukakku, and this is a fantastic pannukakku recipe. They’re all a little different, but so similar. I always top mine with warm berries. I can’t wait to try lemon and powdered sugar. Rebecca, pay zero attention to those that tell you this is not “authentic”! There are as many ways of making this as there are Finnish Iso-Äitis/Mummus! Some use more eggs, some less. Some are stingy with the butter! A definite no no! Some add sugar, some don’t. I cut the sugar back a bit on your recipe… that’s just a personal choice. We often eat it with maple syrup, and that makes it plenty sweet for me. Mind you, the boys would probably be happy if I doubled it! When I was growing up, this was almost always made for breakfasts.. but once in a while we got lucky and had it for supper! We usually ate it with smashed up berries or often a berry soup (kiiseli or soppa). I’ve made your recipe several times now and have been excitedly thrilled about how it turns out. My Mom is gone now and I’m having to make things she made with no recipe. I tried a long time… many many recipes… THIS pannukakku is perfect! Even my grown son told me “This is just like Iso-Äiti’s”! THAT is the best compliment on earth to me! I’ve discovered I like it best when I make it in my 13″ X 9 1/2″ baking pan. It’s so much fun to see it rising in the pan while its baking. Just beautiful! That’s wonderful, Leena! I hope you love it, too! Long may his memory live on! That sounds like an amazing pannukakku! This is so good. We served it with blueberries, strawberries and raspberries and it was a huge hit! It was super easy too so I was able to visit with our guests as it cooked. Yum! I’ll make this again!! I grew up eating pannu kakku made by my Finnish grandma and mom. I never liked it because it had a wet consistency and was flat. I decided to try this because it looked different from theirs and WOW. I’m so glad I made this. I will come back to this often for quick easy weekend breakfasts. Thank you so much, Jenna! I’m a big fan of the lofty, crisp edged pannu kakku because that’s what I grew up eating! I’m so glad you liked this one and really appreciate the excellent rating. My grandmother always baked hers in cupcake pans for individual servings. What a fun idea, Chas. Grandmas are the best.